Hi everyone! Today I have more projects that I created for my Project Reviews for Splitcoaststampers. The Halloween card is using Core'dinations card stock, and the snowflake card is using Impressabilities. I have included links to the review once again, just in case you want to take a peek. Just gorgeous, Rose Ann! LOVE that snowflake card. . .wow! Love both the cards and especially how you punched out the snowflake. Love both of these cards! I love my impressibilities! Oh I love these cards, Rose Ann! Both are different, but wonderful. Now I'm off to check out the links! Two wonderful cards! The halloween one is so fun and the snowflake card is so chic. Love them both! Oh what fun Rose Ann two of my favorite seasons for card making. Oh geez louise! 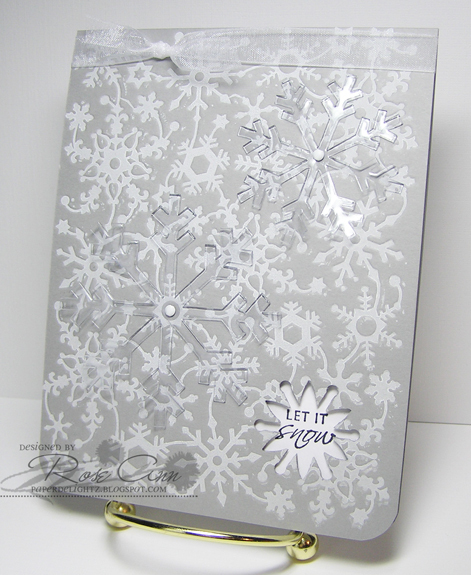 I LOVE that snowflake card...it looks awesome RoseAnn! Both are fantastic Rose Ann! Thanks for inspiring me to get out that cardstock! The Halloween card is so cute! That sanded web looks so cool. Your snowflake card is so elegant, have to check that link out. Two AWESOME cards Rose Ann!! LOVE the web and flakes!! Love both of your cards Rose Ann! It is great to read your product reviews too! Love both these cards-- so eyecatching!!!! 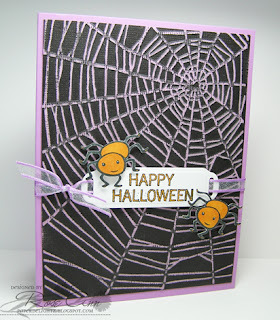 These are perfect examples of what can be done with this cardstock, Rose Ann! Great cards! Fabulous cars! I love the backgrounds Rose Ann. how fun! I love the spiders!! Oh my...how simple and awesome at the same time! Love 'em!